Status: An ethnic group with a distinct language and culture, seeking greater autonomy within Azerbaijan. Population: Official census figures suggest approximately 540,000 across Azerbaijan and Iran. 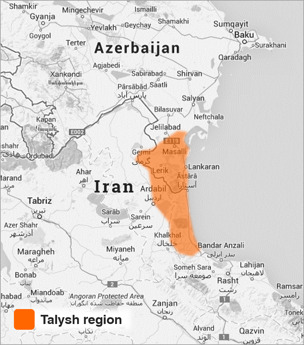 Talysh groups claim a far higher figure: approximately one million, in addition to a sizeable diaspora. Area: Largely concentrated in southern Azerbaijan and north-western Iran, with a major population centre in the city of Lenkoran. Religion: Largely Shi’a, with a Sunni minority in the south. The Talysh are represented at UNPO by the National Talysh Movement. They were admitted to UNPO as a member on 29 June 2014. The Talysh are the descendants of an indigenous population, whose distinct ethno-linguistic identity developed over a significant period of time. Today, the Talysh are subjected to forced linguistic assimilation and cultural alignment by the Azerbaijani and Iranian Governments. Talysh human rights and political activists face strong repression by the authorities. The National Talysh Movement (NTM) was officially established in 2007 in the Netherlands where part of the Talysh leadership lives in exile. Many of its members were previously involved in the formation of the Talysh-Mugansk Autonomous Republic in 1993, including board member Alikram Hummatov. Specifically, NTM advocates for a Talysh province with regional co-governance within the borders of Azerbaijan. This requires a decentralization of power so as to promote fairer representation of minority groups, as well as to ensure cultural and linguistic freedoms. Moreover, a uniform provincial federative decentralization would pave the way for peace in Nagorno-Karabakh within Azerbaijan. NTM re-established their UNPO membership in 2014. As with many other minorities in Azerbaijan, Talyshi speakers are subject to aggressive attempts at assimilation – there is no formal education in Talyshi and reading and speaking the language is discouraged by the authorities. Instead, Talysh are encouraged to use Azerbaijani or Persian in formal situations. As such, the number of young people being educated in Talyshi is declining, as the language is now classified as “vulnerable” by UNESCO. This represents a serious threat to the cultural integrity of the Talysh, and as such one of the key aims of NTM is greater linguistic freedom. Talyshi press and literature enjoyed free distribution until the 1930s, but Stalin-era policies resulted in Talysh nationalists being sent to gulags and the abolition of local media. The Talysh were encouraged to align themselves culturally with the Turkic traditions of the Azerbaijani SSR, a pressure which continues today under the Aliyev regime. In June 1993, during major political unrest across the Caucasus, Alikram Hummatov declared the formation of the Talysh-Mugansk Autonomous Republic, also known as Talyshstan, as a response to the turmoil. However, the self-proclaimed state was short-lived, lasting only until August 1993. With the accession of the Aliyev family to power in Baku, the Azerbaijani central government reclaimed power in the region and Hummatov was sentenced to death for his activities, a penalty which was subsequently commuted to life imprisonment. Hummatov was released in 2004 due to pressure from the Council of Europe, who had classified him as a political prisoner. However, he was stripped of his Azerbaijani citizenship and now lives in the Netherlands. He subsequently took the state of Azerbaijan to the European Court of Human Rights and won. More recently, the “National Council of Democratic Forces” ran against the Aliyev government in the 2013 presidential elections as a democratic alternative to the ruling regime, giving the Talysh hope of political and social reforms which would afford them greater autonomy. However, as expected, Aliyev won the election and the awaited reforms have failed to materialise. Please download our Talysh Member Brochure.